Browsing all the amazing hand-drawn fabric designs for this week's contest–not to mention the pen, ink, and watercolor renderings for the Fabric8 contest–has gotten us pretty excited lately about designs created by hand. To my eye, there's something so organic, approachable, and just plain human about designs that are drawn and painted by hand, even after they've been turned into a digital file. The little line variations and imperfections of designs created in this way are just so compelling to me. If your interest has been piqued by this approach to designing, too, why not enter this week's giveaway of a swank new set of Lyra Aquarelle colored pencils and a giant pad of high-quality drawing paper and get started! As always, to enter our giveaway please just leave your comment below or on the relevant Facebook post, and do include your Spoonflower screen name or other means of tracking you down easily. Entries close next Tuesday, 5/29 at 7 pm EST, and we'll announce a winner on Wednesday, 5/30. Good luck, everyone! 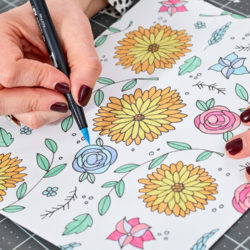 And while you're brushing up on your drawing skills, you might want to check out Julia Rothman's tutorial put up on Design*Sponge awhile back that shows how to turn a hand-drawn image into a repeating fabric design with just a pair of scissors and some tape. I've been sending people to this one for a couple of years now which makes it an internet oldie, I guess, but it's a very goodie. The winner of last week's giveaway of $50 of Spoondollar credit and a copy of Handmade Weddings is Irina Elenskaya in Ukraine–congratulations, Irina! I’m game. I’ve always thought I like to give designing a try. I’d love to win these, I’ve been looking for pencils/markers for a while and haven’t decided what to get. This would solve it! oooh, that’d be so fun! thanks for the impetus to draw! I’d love a chance to win these. I’m “the_bearded_lady on spoonflower. My Spoonflower screename is douar! my pencils are worn down to little nubs…I would LOVE to win this set!!! This would be an amazing thing to win! I always need new supplies. Thanks for the chance to win some! I would lovvvvveee to win this! I need to get back to drawing on paper, I miss it! I’m neetz on Spoonflower. I’d love to win these! I would love to win such a wonderful prize! What a beautiful set. I’ve been neglecting my drawing but would like to take it up again. A beautiful set of pencils!!! I have been meaning to start designing and this looks like exactly what I need to inspire me. These would be an amazing gift for my very artistic daughter. She lives to draw! There’s something wonderful about a box of pencils: the combination of simplicity and endless potential. Excellent giveaway, thanks! Lately, I’ve been experimenting with markers, my fine-point black Sharpie and colored pencils to create hand-drawn patterns. Would love the color/texture fuel of this spectacular set! Those pencils look beautiful, would be a great incentive to start drawing again. I’d love colour pencils! I’m smokey_longlong on spoonflower and loving the weekly contests! What a wonderful prize! Yes, Please! I’m tippstert at spoonflower. Thank you! I would love to win this prize, and I promise to put it to good use!!! Such a big box of colored pencils would finally kick me in gear and get all these designs floating in my noggin’ down on paper and on Spoonflower fabric! I would love to win this! Lyra colored pencils are the best, and I have been itching to work out some new designs that are floating around in my head. This set is just what I need to make that come about. Beautiful set! It would spark my creative juices…. drawing pencils + drawing paper = summer fun. Count me in! Ooooh, I’d love to play with those pencils -thank you for a creative giveaway! Gorgeous set of Pencils! I would love this for my daughter (16) who is a fabulous artist! Thank you for the opportunity! Love to win that beautiful pencil set, perfect to give me a clear summer inspiration!! Ooh! What a beautiful box of potential! Great giveaway. These lovely pencils make my pulse quicken. Thanks for the contest! Great giveaway! I would love to win the pencil set and drawing pad! What a wonderful giveaway! Spoonflower user keweenawchris hopes to win…. My email add is denisejohn@comcast.net. Thank you! 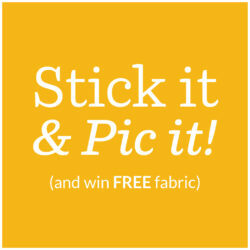 What a great give away … something to help me fabric8! What a wonderful giveaway! Those colored pencils are top quality. Please count me in. This might be the inspiration I need to start drawing again! those pencils are amazing! Love working with them. I’m so glad you had a hand-drawn contest, and I like that these pencils don’t have paint on the outside. What a stunning set of pencils. I would so love to win it. This would be an amazing set of pencils! Please enter me! sandie’sfacinations on Spoonflower. Yummmyyy… I shall want. I shall covet. What a great way to design my first fabric. So many colors to choose from but there will be yellow in my fabric for sure. That’s a great prize pack. I do most part of my designs by hand and I use a lot of different techniques, but I LOVE working with color pencils… they are my favorite art tool! oh what a perfect giveaway – i use my coloured pencils almost daily, still using the box i got over 15 years ago I desperately need new ones! Hi there! My spoonflower-name is evexxx! I really want to win 🙂 Nice greetings from Austria to all of you! What is it about coloured pencils they’re so appealing, just like lollies, you can never have too many, but they are much better for you. So lovely to have, such a lasting gift that gives pleasure for so long. Lyra pencils are the best – great prize. The Drawing Set is beautiful. I would love to win this. It inspires me! Thanks! denisejohn@comcast.net. Sorry for posting twice. You can delete one. Beautiful, beautiful….I would love to win these! denisejohn@comcast.net (My bad, I commented twice, please delete my first one) Thanks! Please put my name in the hat for these lovely pencils – I really enjoy Spoonflower and all he contests and fun fabrics! These are very nice, I’d love to win these! Thanks for doing this, it’s a great giveaway!! 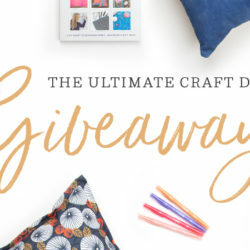 Wow — what fun these would be — that contest of hand drawn designs was fantastic and so inspiring — these would be quite the tool to get started on my new designs. Fingers and toes crossed !!! Lots of colors to play with! It’s like the first day of school all over again! Yay! I would rearrange my crayons over and over, first by the rainbow, then by contrasting colors, etc. And yes, then, I would actually use them! Sign me up! Thank you! What a beautiful set of colored pencils! 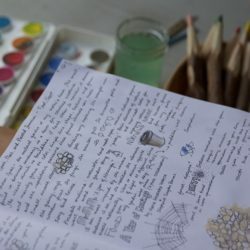 I would love to create with them! Awesome giveaway! That’s a beautiful set. I had some nice ones, and then my twelve year old got interested in doing some more serious art. Somehow, since then, my pencils have disappeared. Winning is the top of the iceberg in blues, grays, and white space – It is how one embraces, and colors, one’s life with the pencils ! If I win, I will donate to a homeless shelter – I know these are beautiful pencils. I would like to support a young person’s dreams through design and creativity – letting them know whatever obstacle may appear to be in the way can be transformed, drawing rose colored glasses ! Namaste. These look beautiful. I would love to win this prize. Thank you for the opportunity. Just when my girls have completely taken over my favorite colored pencils, here you are offering some. Perfect! Oh, the pencils are lovely! I’m making due with some not so good ones, and that would be a welcome addition to my art supplies. These look beautiful. Thanks for the chance to win. New to the site and to quilting. I love all the fabrics, but I’d love the box of colored pencils as well! These would be a wonderful addition to my collection of fabric-designing toys! My Spoonflower name is Bargello Stripes.